"Everyone has that moment, I think, that moment when something so...momentous happens that it rips your very being into small pieces. And then you have to stop. For a long time, you gather your pieces. And it takes such a very long time, not to fit them back together, but to assemble them in a new way, not necessarily a better way. More, a way you can live with until you know for certain that this piece should go there, and that one there..."
What initially drew me in with this novel was the cover. So simple yet so intriguing. After reading the synopsis, it was no secret that this book was going to be a heavier read. 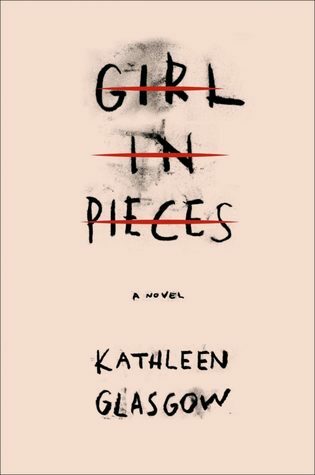 Girl in Pieces is Charlie's story. A seventeen-year-old girl that has already lived through and suffered more in her short years on earth than what some of us only see in our darkest nightmares. She is battered and bruised both inside and out. The author, Kathleen Glasgow, delivers Charlie's story in a poetic, lyrical way. At times the story almost reads as if it is poetry or a journal. Some pages are just short paragraphs while other parts of her story require much more space. Charlie's presence is very strong. Her character leaps off the page and she whirls around you, whispering her tragic story and secrets in your ear. Girl in Pieces will challenge you. It will leave you saddened, breathless, angry and absolutely awe-struck. It will make you question the way you see others in the world and will open your eyes so wide. We all know that "everyone has their story" but Charlie really brings that into realization. Charlie is not the only character in this story that has a dark past...or present for that matter. We also spend a lot of time with Riley, a young man that at first seems to swoop up and save Charlie, only to lose flight in his wings and plunge her deeper into the darkness. Riley is a tumultuous character. He is charming, and it is that quality that seems to bail him out of everything he gets himself into. He has this charisma about him that no matter how wrong he may be, you can't help but want to be with him. Know more about him. I definitely developed a love-hate relationship with Riley. Girl in Pieces is hauntingly beautiful. Though during this thunderous storm, large rays of sun do shine through. Rays of hope not only peak through the rolling gray clouds, they part the sky completely. It is a coming of age story. A story of self-discovery and growth. But this novel is so much more than just Charlie's story. Every character in this book has their moment. We meet so many colourful people that by the end, we're left with this beautiful mosaic; each character adding their own broken piece that by the end, creates something marvelous.